Animal was one of many Vicious Circle members that had grown frustrated with the leadership of OverLord. These rebels formed their own splinter group known as the Annihilators that served as the muscle to OverLord’s former lieutenant, CyberFace. Before they could challenge OverLord’s rule, the Chicago Police Department deployed their Freak Force team to prevent a gang war. The Annihilators ended up being folded back into the Vicious Circle when CyberFace gained power over the criminal organization. Animal served within the group from that point onwards. When Solar Man was waging his war upon crime, Mako gathered together a small army of Vicious Circle members to counterattack. 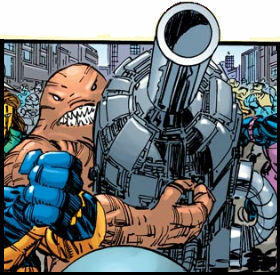 Animal wielded a giant gun that was meant to bring down their foe but Solar Man’s speed allowed him to avoid the blast and Animal then had a hole punched clean through his chest.